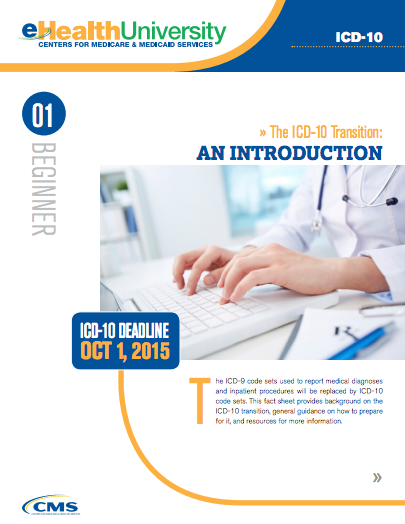 If you're in the healthcare industry, you're aware of the impending transition from ICD-9 to ICD-10 on October 1. "What the heck is 'diagnosis coding,'" you ask? ICD or International Classification of Disease is a standard of codes used to describe patient diagnoses. ICD-9 was set in 1975, so we're long due for an update so that doctors can more precisely diagnose diseases using the standard. Incidentally, ICD standards are also used by payers for billing and reimbursement purposes. The U.S. federal government has mandated that all entities covered by Health Insurance Portability and Accountability Act (HIPAA) must conduct healthcare transactions using ICD-10 codes by October 1. What happens if the wrong code type is used after that date? Well, you run the risk of returned, rejected, or unprocessable claims. Simply put, non-compliance = halted cash flow. OK, "Healthcare's Y2K" may be a bit of an exaggerated title for this post. ICD-10 conversion won't cause the next apocalypse but its effects will ripple through many layers of the healthcare world, starting with the hospitals. The Centers for Medicare & Medicaid Services offers a helpful ICD-10 factsheet explaining the conversion. First, can you identify and document all interfaces in your environment that deal with ICD codes? Next, up the ante to include the applications behind those interfaces in your list. Would compiling this list require referencing architecture diagrams? Do you know the dependencies between each and every interface and their associated applications? What level of certainty do you have that the production environment matches the designed diagram? What about legacy applications? Are there rogue or forgotten apps running in your environment that aren't showing up in your documentation? Not as easy after all, is it? In most cases, the comprehensive list of interfaces exists in an Excel document that is manually updated. Since humans aren't perfect, mistakes happen. These lists can quickly become erroneous and outdated. You certainly don't want an application or interface to slip through the cracks during the conversion, thereby potentially impacting revenue. But don't fret! This is where ExtraHop comes in. The network is the common element that ties all components within your environment together. 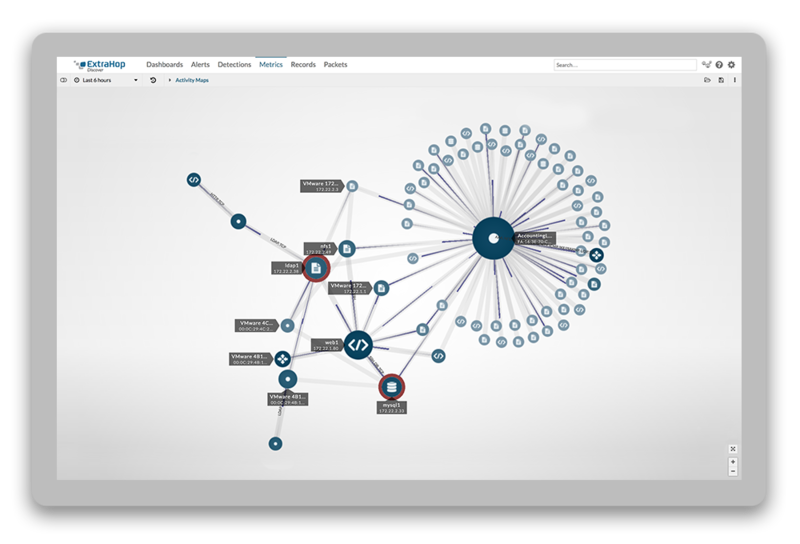 Listening on the wire, ExtraHop is able to passively analyze, in real-time, each HL7 message regardless of the interface vendor. You heard it right, regardless of vendor type! Right out of the box, as the interfaces begin communicating, ExtraHop auto-recognizes and auto-classifies ALL interfaces and the applications behind them. Boom, question 1 and 2 answered! Theres no longer any need to laboriously update a spreadsheet. And human errors? Forget 'em. ExtraHop takes the data right off the wire; straight from the message itself and the wire don't lie. Read what wire data analytics can do for healthcare organizations. As if that's not enough, since ExtraHop is listening to the actual wire data, answering questions three and four are a breeze. With no user intervention required, ExtraHop passively listens into the HL7 conversations and identifies dependencies between all active interfaces and applications. The actual ICD-10 conversion will be rather abrupt. On October 1st, with the flip of a switch suddenly we'll find ourselves in ICD-10 land. Because the actual transition is so stark, there are two things you'll need to be aware of to ensure you are compliant during the conversion process, both now and after October 1st. Before October 1st, only ICD-9 codes should be used in production. Dry coding runs will be critical in ensuring your systems are prepared to handle the newly required ICD-10 codes. However, during those testing phases you don't want ICD-10 codes leaking into your production environment. After October 1st, the switch is flipped and only ICD-10 codes should be used thereafter. You may be asking ..."What assistance can ExtraHop provide me during this conversion? What happens after October 1st?" After all, hidden problems with the interfaces are bound to arise. Say, for example, that an ICD-10 code does find its way into production prior to October 1st? How will you know about it? Will you have to wait until the claim is returned or rejected? What if its simply not processed? With ExtraHop, you'll know about noncompliant ICD codes as soon as that message hits the wire. ExtraHop can also help after October 1st. If an ICD-9 message is sent out, you'll know about it immediately. You can now focus on fixing the issue, not searching for the cause. After the conversion the work on ICD-10 will be far from over. There will be plenty of work to do as the focus shifts towards monitoring for necessary tweaks and corrections. ExtraHop gives you the visibility needed to take the right actions to ensure you're in good shape for the impending ICD-10 conversion. Don't wonder if you're compliant–know you are. ExtraHop has your back. 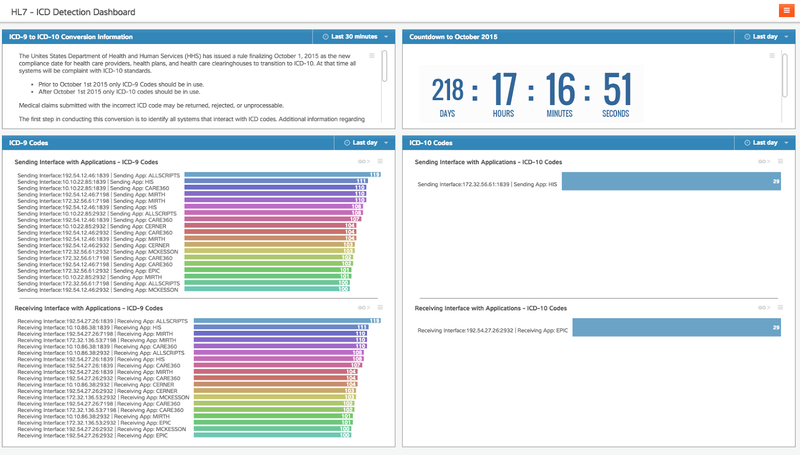 The ICD Detection Dashboard in ExtraHop provides you with visibility into all ICD-9 and ICD-10 codes used in your environment. Click to enlarge.